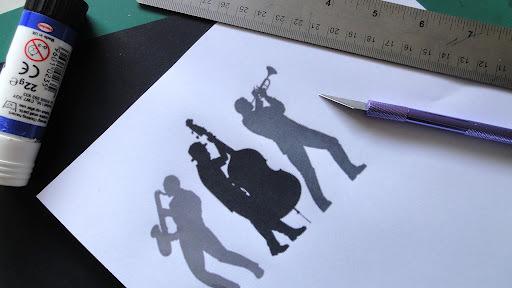 A simple Pop-Up that is possible to make with children: the “Jazz band” is a stair cut from an old score, you just follow the instructions drawn on the sheet of squared paper, and glue some black silhouette (musicians, dancers, singers…) to have your personal concert! Davvero bello, il tuo blog offre molti spunti e non solo a chi, come te insegna arte nelle scuole, ma anche alle mamme alle prese con la creatività coi propri bimbi e ragazzi. Molto bello anche il video di Paolo, lo farò vedere al mio bambino di 8 anni. grazie per condividere tanto lavoro e tanta bellezza (di cui tutti necessitano!) 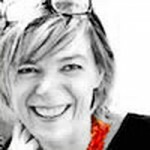 …buon lavoro Miriam! Grazie per il tuo commento! In effetti attualmente non sto insegnando e mi ritrovo a fare un sacco di cose a casa da “sperimentare” sui miei figli, intanto sto confrontandomi con il sistema educativo inglese che dà moltissimo spazio alle attività pratiche e creative, secondo il concetto “learning is experience…”.Per la bellezza poi non si lavora mai abbastanza… ma ci proviamo no? Sempre fantastici i tuoi lavori. Un abbraccione dall'Italia. Can you share how you created this? hi Ms. C! You can follow the instructions in the pictures. 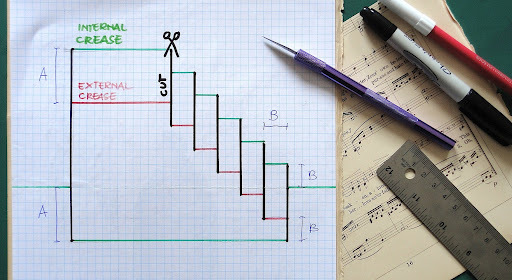 If you draw the stairs on a squared paper you just paste it on a cardboard ( a page of an old book or an old score) and cut just the BLACK lines. 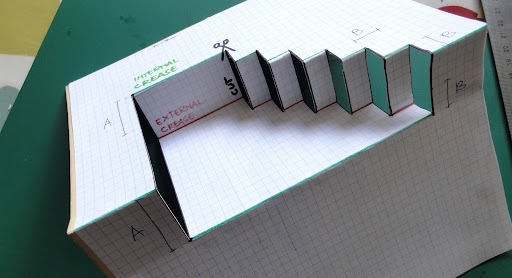 You fold externally the REd lines and fold internally the GREEN lines. Then you can glue every kind of shilouette… don’t have problem to ask me if you have other questions! I love this card. Is there a template for the background? This will be perfect for my art journal. Love your card. 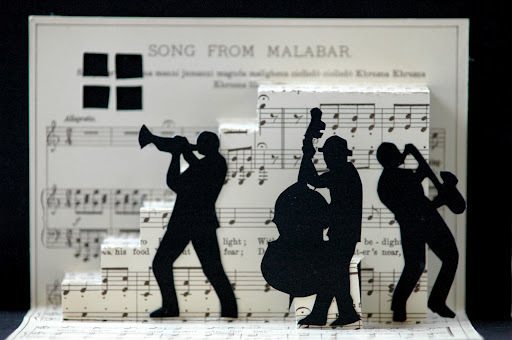 Wondering where you found the musician cut-outs. 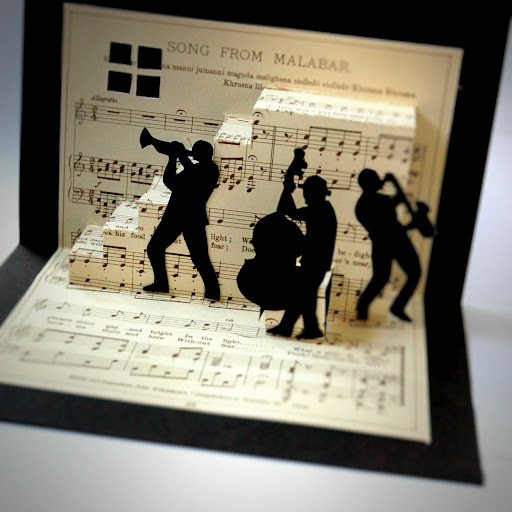 Also is the music sheet also card stock or a lighter weight? Also does the card fold and fit in an envelope and if so what size. Thank you very much. Thank you Miriam. I think your creativity is brilliant. 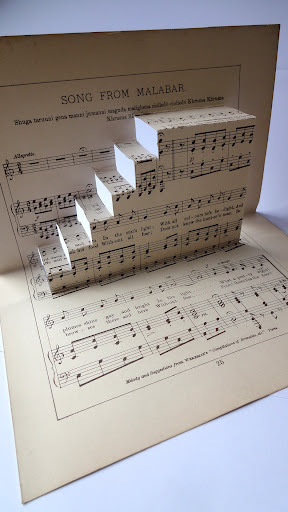 In the U.S.A the sheet music is printed on very light paper which won’t hold the pop out stairs. Our cardstock paper runs from approx 50lbs to 130lbs. So I was wondering what you would recommend as far as the weight for both the black sheet and the music sheet such that the music sheet will function properly yet still be manageable to cut in quantity. 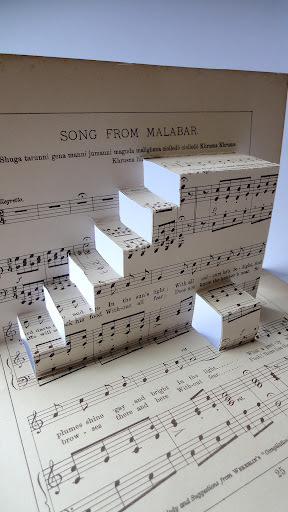 I can have the music sheet scanned on to any weight paper. Thanks for your help. I’m hoping to make 100 invitations to showcase a young musician for an intimate small venue/in home concert. Hi Robert! I took this music sheet from an old book which I’ve found in a second hand books market in Bristol. 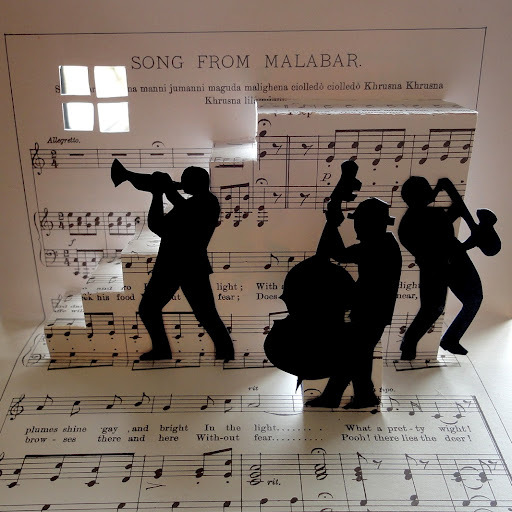 The paper is quite heavy, but, as you say, you can scan and print the paper on a heavier cardboard, or you could also paste the music sheet on a cardboard. Your solution is the best one I think. I wish I could be there at your home concert, it would be very nice!! If you send me a picture of your invitation, I’ll be pleased to publish it below this post. Thanks for your suggestions! Hi! Could I please have the exact measurements for A and B?